Today we’re going to be joining Susanna Leonard Hill and her Perfect Picture Book Friday. I want to introduce you to my favorite book – Looking Out for Sarah. This book is written and illustrated by Glenna Lang. It’s a non-fiction book published in 2001 by Charlesbridge Publishing. It would be suitable reading for kids in kindergarten thru elementary school. And for dogs who care about their people! My Mom Person got this book for me when I was a wee pup. She read it to me often and told me that this is what my life would be someday. Things didn’t really work out that way tho. I didn’t become a guide dog. But I have an important job just the same. Looking out for my Mom Person! 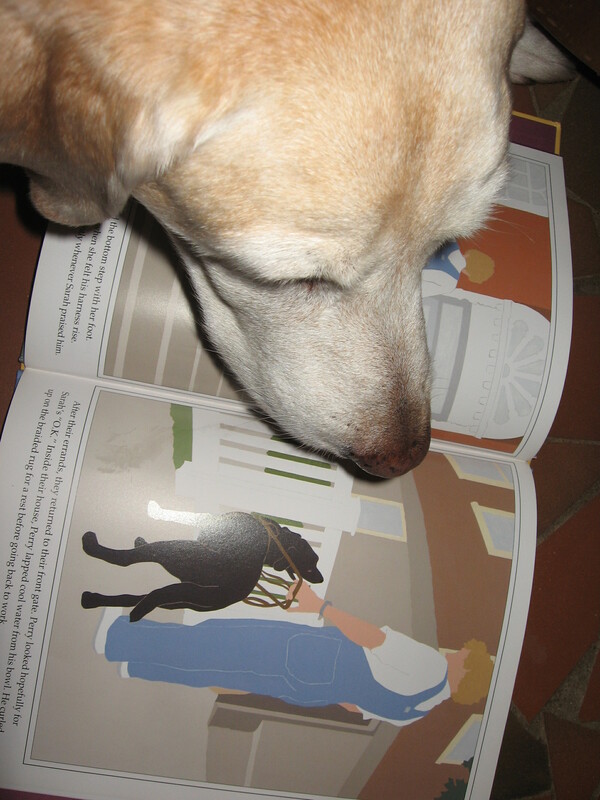 The book, Looking Out for Sarah, tells us about Perry, the guide dog, and his days taking care of his person, Sarah. It begins in the morning as Perry is waiting for Sarah to wake up. I like when it says, “A wag filled Perry’s tail and traveled up his back.” He loves his Sarah. Perry guides Sarah through her very busy day, ignoring yummy food on the sidewalk, watching out for obstacles and traffic, and waiting while Sarah does the things she has to do. They go shopping, ride the train, and visit school — just like me!! But the book isn’t just about how Perry takes care of Sarah — it’s also about how Sarah takes care of Perry. They are a working team, dependent on each other. This book could provide a good opportunity to have talks about blind people and other people who might be different in some way. They still do all the same stuff everybody does. There might be a guide dog school near you with puppy raisers or trainers who could come visit your school. We have some puppy raiser friends who love to talk about their pups! You could get some really good info about blind people and all the cool stuff they have to help them get around in the world from the National Federation of the Blind . You could also have a talk about our senses and how if one doesn’t work too well, you have to rely on others. You know, dogs have a really really good sense of smell! And here’s one more link to a site that has a lesson plan using another book about a guide dog, Safe and Sound. Look for Looking Out for Sarah at your library! And check it out! You’ll be glad you did! 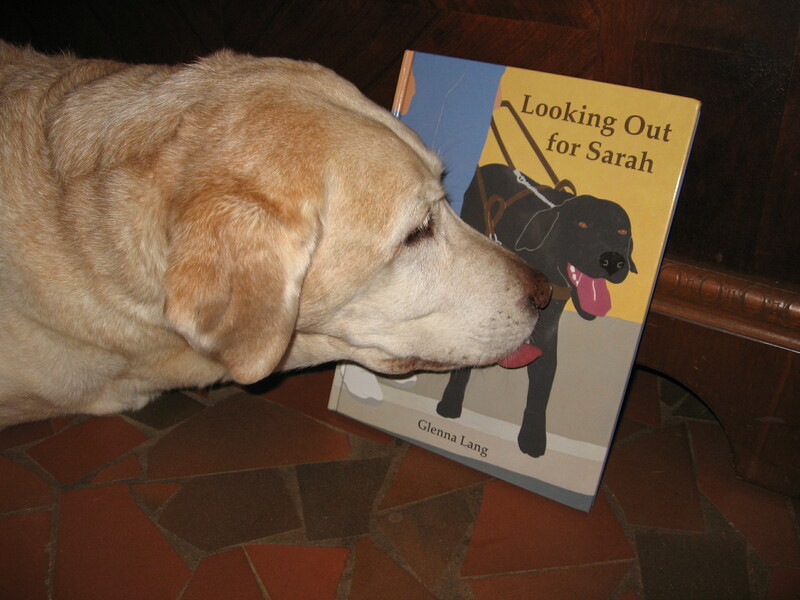 This entry was posted in children's books, cooperation, dog care, dog training, guide dogs, reading dogs, special needs, teamwork and tagged Glenna Lang, Guide dogs, Looking Out for Sarah, NFB by readingwithrhythm. Bookmark the permalink. This looks like a very cool book. Great way to teach kids about the blind and how blind dogs work. I am always interested in this topic, we nearly got a dog for training for the blind, but then I realised I just would not be able to part with it. Excellent choice for Susanna’s list Thankyou. It is an emotional ride to raise a guide dog pup. But the rewards are immense! Sometimes the pup returns to be your forever dog, and sometimes it moves on to bigger and better things. To see a finished working guide dog and know that you had something to do with that training is like watching your child obtain a phd. I’m glad you liked our book choice. you should check it out! This sounds like an excellent book! I’m so glad to know there are picture books to show kids what important work guide dogs do. I’ve seen a couple of chapter books about a guide dog in training, Rescue Pup and Forward, Shakespeare by Canadian author, Jean Little. Looking Out for Sarah sounds as if it would be a super way to start kids thinking about guide dogs. Thank you! My Mom Person has a whole collection of guide dog books that she shares with the school kids we visit. She uses me as kind of a guide dog ambassador. Thank you for checking out Looking Out for Sarah. It’s my favorite one. I put this on hold as soon as I saw the pics on your post – looks terrific! I never thought about it, but I bet many kids have no idea what a guide dog does. This looks like a wonderful introduction to service dogs. It is sometimes amazing how little people know about the actual work of a guide dog. And I love this book because it does give a pretty good picture of what a guide dog deals with. This has been a fun experience for me! I’m getting to meet lots of new people. And Cats! I’m glad everyone likes the book that I chose. As I said, it’s my favorite. I also discovered some interesting books on your PPB list that I hope I get to read. Thanks for letting us on board. Well, I must say you are a good reviewer for a dog. (Actually, better than some humans.) I enjoy the pictures of you reading the book. It is nice to know the reviewer really reads the book before saying anything about it. People might not have believed you actually read. So bravo to you! Guide dogs are a wonderful gift and much needed. I love books like this that tell the story of guide dogs in a way that kids can understand their importance. I like the links you have included. VEry nice review. I think I have found a great site to follow. Just don’t tell my cats, please. I like cats. We have a queenly cat that lives with us. I would like to meet your cat. Thanks for checking out our story. Kids love books like this. When I sold books to schools, the librarians were all over the “Dog” series that highlighted service dogs. They are such amazing animals. I also find that people are interested in all the marvelous things that dogs can do to help people. We dogs love being needed. Love you choice. Like books about service dogs – and so do kids. Beautiful story. thank you for the nice words. It is a lovely story. Thank you so much for sharing this book! We see guide dogs leading their ‘people’ …but so much goes into training these loyal and special friends. 🙂 Last year I was part of a blog tour with “Read with Max”, part of a series of books about guide dogs. I have some serious eye issues…so these books are very meaningful to me…I appreciate the amazing service these dogs provide. Thank you for the nice words. Guide dogs do get alot of training, but working dogs all enjoy their work. All the working dogs that I know are very happy taking care of their people. I don’t know about “Read With Max”. I’ll have to check that out. Looks like a good book and you have a really cute dog. Thanks so much! And thanks for visiting!